This month has been very hectic with the kid writing his summative for the first time, both of us have been neck deep in studies. My role largely was to push him to do his best and help him with his difficulties and he was to ensure that he is thorough with his subject and does his revision properly and efficiently. I have avoided giving him any outside food and made simple, tasty and ‘chatpata’ food which he likes and eats without making fuss. And to my delight this month’s Monthly Mingle theme just helped me cook more of the ‘chatpata’ kind. For this month’s Monthly Mingle we were given two very healthy and interesting ingredients, whole wheat and corn. I knew what I wanted to make with these as I had been planning to post it since long and the event just pushed me more. My kid loves chaat and I find that a good way to introduce veggies and feed him. 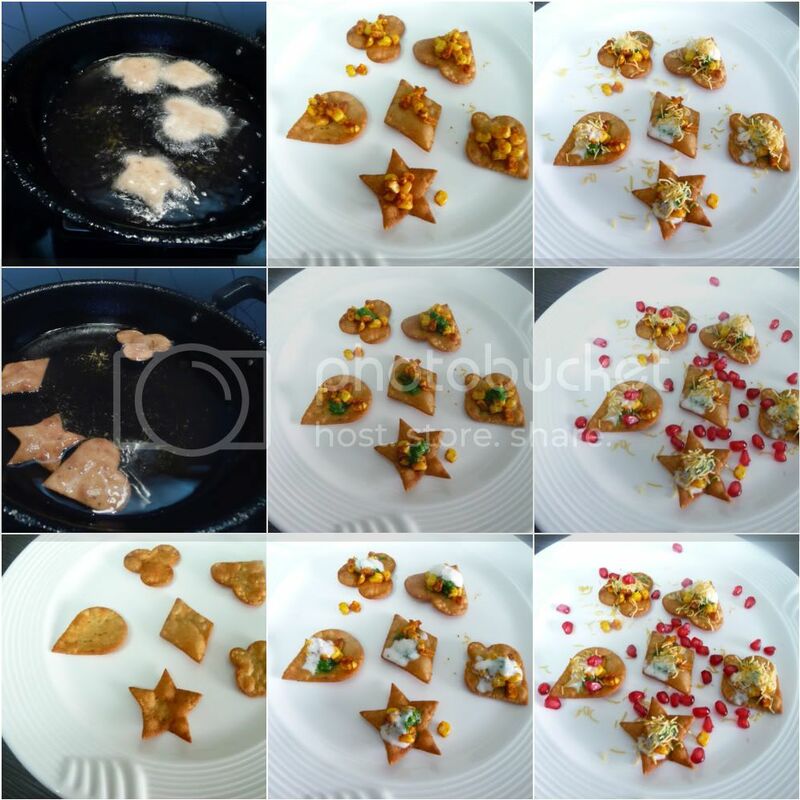 I came up with idea of making canapés using whole wheat flour and daliya (whole wheat rava) and a spicy filling of corn. The end product was so tasty and the three of us finished the entire batch of canapés in a go, it was just perfect for the cloudy weather outside . Sending this combination to Monthly Mingle#3. Mix all ingredients under the heading of canapés except milk and then using milk knead a tight dough and rest for an hour. The daliya needs that much time to soak the milk and soften. Take a ping-pong ball size dough and roll it to a 4mm thickness. Using cutters, cut different shapes. I used different shape cutters, to make them look more attractive. Prick with the fork, so that the canapés do not puff. Deep fry the canapés on a medium flame till crispy and golden in colour. Remove them on the kitchen towel. 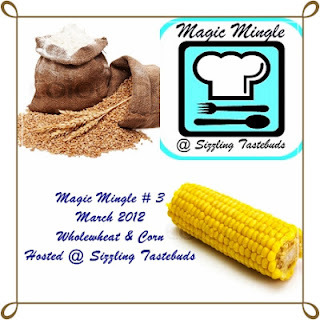 For the filling, boil the corn without salt (else it hardens) and strain. Heat a tea spoon oil and on high flame and tip in the corn. Sauté and mix all spice powders. Switch off flame and mix. Prepare the green chutney and the curds by using the ingredients mentioned under their respective headings. Place the canapés on the plate, place 1/2tsp filling on each, followed by the green chutney and curds. Sprinkle the Nylon sev and garnish with pomegranate seeds and chaat masala. Serve immediately else the canapés would soften. Nice appetizer, looks very tempting..
yummy... kids would love this chaat! The canapes looks cute and too tempting to resist...Colours everywhere ! This is such a feast to the eyes n to the tummy !! beautiful clicks n presentation!! Very attractive and yummy recipe. Very interesting! Such colourful clicks! Do vote for your favourite recipes in the Gimme GREEN entries! colorfuland delicious looking recipe...looks yumm. wat a beauty!i want one now! Love those cute shapes..looks healthy! These look so delicious and colorful! Great post! Look forward to reading what else you have planned. ooooooooooh!!!!!! simple amazing! love the plate!...mouth watering! Nice snack to munch on!! Yummy delicious chaat,looks innovative..n sure a kids delight!! Very nice - loving it!! lovely canapes. Like the shapes. Perfect snack. Cute platter,..would luv to taste this anytime""
Though the ingredients looks long, the prep is very easy!! very innovative indeed!!!! wonderful canapes and a nice starter. 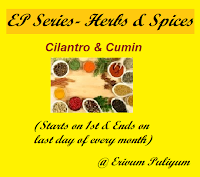 Thanx for linking it to my event..
Looks similar to rasam,flavorful tangy combo!! Thanx a lot for linking it to my event! !